Tip: Take note of your claim number, as it is their internal reference number for your file, and refer to it when speaking to or emailing your adjuster(s). Your specific adjuster may change over the lifetime of your file, but the claim number will remain constant. Let’s move on to their insurance company. Before we dive into the different adjusters that their insurance company will assign to your file, let’s begin by clarifying who “their insurance company” is, because it is not always straightforward. If the other driver involved in the collision is both the owner of the vehicle and the driver of the vehicle at the time of the accident, then who “their insurance company” is should be straightforward: it is the company that they have purchased a policy of insurance from. If they are the driver of someone else’s vehicle, then (in most cases) “their insurance company” would be the company that the owner of the vehicle purchased insurance from. If you are the passenger in a vehicle and the driver of the vehicle that you are in is at fault in the accident, “their insurance company” would (in most cases) be the company that the owner of the vehicle purchased insurance from. Please note that in this situation, the same insurance company would be both “your insurance company” and “their insurance company”. 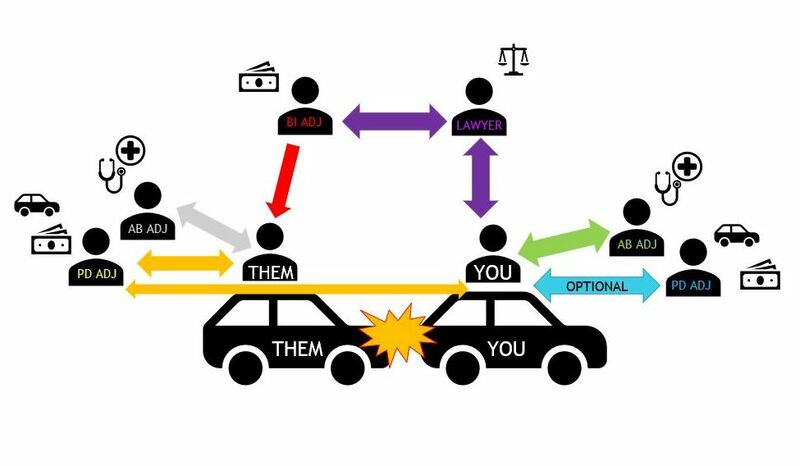 In this type of situation, the passenger’s file would be assigned two sets of adjusters: “your adjusters” (PD/AB as described above, and as applicable), and “the other side’s adjusters” (PD/BI as described below, and as applicable). Please note that the above are simplified examples. There may be other factors that complicate whose insurance will be considered as “their insurance company” for the purposes of your car accident claim. Claims can quickly become more complex where the other driver or vehicle owner did not have insurance, or the vehicle was stolen, for example. Once the accident is reported to their insurance company, they will most likely open a claim. They may then try to follow up with the other vehicles and individuals involved to try to determine how the accident happened, who is at fault, and if anyone has been injured. Depending on the facts of the matter, your car accident claim file with them may have up to 2 adjusters assigned to it: a Property Damage (or “PD adjuster”) and/or a Bodily Injury (or “BI adjuster”). Each of these adjusters serves a different role, which we outline briefly below. Still struggling to figure out who all the adjusters are with respect to your accident? A personal injury lawyer can help you to navigate this process and get just compensation. At Moustarah & Company, our experienced personal injury lawyers can assess the facts and your situation, provide you with an outline of your options, and help you navigate your personal injury claim. Call us today to book a free initial consultation.